The introduction of the international energy saving certification 80 PLUS for desktop power supplies in 2004 has significantly changed the PSU market. Efficiency has turned into the guiding theme of the following years. PSU manufacturers quickly stepped forward and developed new technologies to achieve higher and higher efficiency rates. Accordingly, the 80 PLUS organisation extended the certification system with Bronze, Silver, Gold in 2008 and finally Platinum at the end of last year. With its own R&D team and its own PSU production, Enermax plays a leading role in the development and market introduction of energy saving PSU technologies. Series like Modu82+, Revolution85+ or Modu87+ have won the most influential international awards and set new standards in terms of performance, quality and design. Also the latest Enermax creation, the high-performance MaxRevo series, continues the success story of its predecessors. 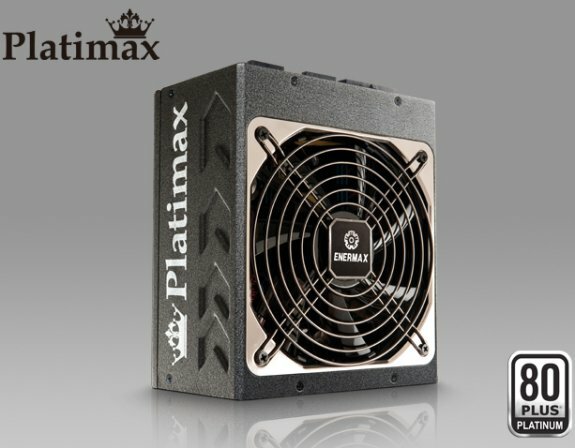 With the Platimax series, Enermax now enters a new PSU generation. Platimax already possesses the highest 80 PLUS Platinum certification. The manufacturer successfully refined the technologies of the previous PSU series and increased the efficiency to a level of over 90% between 20 and 100% load. While the Platimax models below 1kW are based on an improved version of the "Dynamic Hybrid Transformer Topology" (DHT) that has been applied in the Modu87+ series for the first time, Platimax 1200W and 1500W make use of the powerful "Full-Zone Magnetic Quadrant Transformer Design" (FMQ) of the MaxRevo series. Enermax optimized especially the cooling system, applying high-quality and performance-capable heat sinks and installing a well-arranged and well-thought layout to avoid unnecessary energy losses. Like Modu87+ series, Platimax comes with a patented RPM control that limits the fan speed at low load to 300, 600 or 900 RPM depending on the model. Combined with the smooth running Twister bearing, the power supply offers a virtually silent operation. All Platimax models support the latest EU regulation for PC systems, ErP Lot 6. According to that, they consume less than 0.5W in standby mode. Furthermore, the so-called "Zero Load Design" insures a stable system operation at loads below 1W. Thanks to that, users can take full advantage of the energy-saving modes of latest CPU and graphics cards (C6 State / Hybrid Mode). As usual, Enermax uses a Multi-Rail Design with three to six 12V rails depending on the model. Each rail is equipped with a separated over current protection (OCP). For systems with overclocked graphics cards or processors, Enermax will introduce the Platimax 1000W OC Edition with One-Rail Design. It provides up to 83A (996W) on one 12V rail to reach best possible clock rates and get the most power out of the hardware.